A SURVEY of rail passengers suggests that their trust in the industry is falling after a year of disruption caused mainly by poorly-planned timetables and industrial action. The survey has been released as Network Rail chief executive Andrew Haines was telling a railway audience in London this morning that the details of train operations have been ‘possibly neglected’ at NR over the past decade. The figures published today by the consumer organisation Which? are the result of questioning more than 10,000 passengers. The samples for individual operators were much smaller, ranging from fewer than 100 to more than 200 for the larger franchises. Other operators close to the bottom of the table were Thameslink and Southern. These three operators all experienced major problems after new timetables were introduced in May. In spite of several changes later in the year which were intended to improve matters, the industry as a whole then decided to scrap most of the changes which had been planned for December 2018 to allow more time for corrections. Northern has also experienced more than 40 strikes by RMT members in the continuing dispute over on-train staffing, which have added to the disruption. The best-rated company according to a sample of 72 respondents was Island Line, which achieved a ‘customer score’ of 68 per cent and almost full marks in the individual categories, such as value for money. Which? said there is a growing level of distrust of the rail industry. It now stands at 32 per cent, which is five percentage points higher than a year ago. 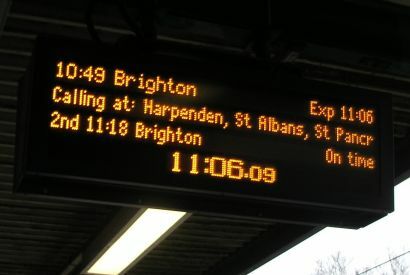 Network Rail’s Andrew Haines has attributed some of the problems to congestion on a much-busier network, some of which operates close to capacity. Responding to the Which? survey, Rail Delivery Group regional director Robert Nisbet said: ‘We want people to have punctual, stress-free journeys and rail companies are working together to improve, with December's punctuality the best in five years. As part of our long-term plan we're rebuilding key parts of the network to improve punctuality and putting thousands of new and refurbished carriages on track to make journeys more comfortable.